During WWII, Phil Davis (Danny Kaye) saves Bob Wallace’s (Bing Crosby) life. Bob, who was a famous singer and vaudeville act before the war, tells Phil he owes him. big mistake as Phil takes him up on that and, much to Bob’s chagrin, they become a–very successful–two man act after the war. 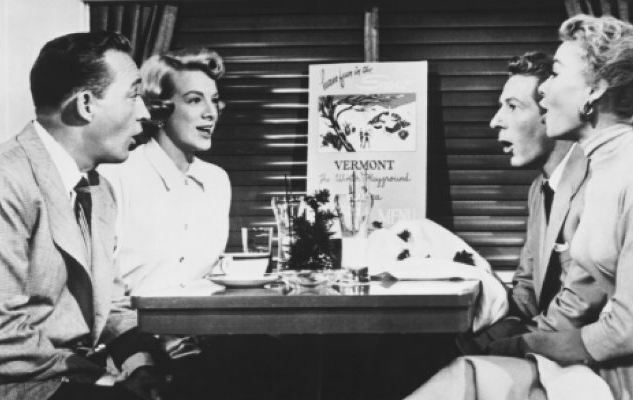 Betty (Rosemary Clooney) and Judy (Vera Ellen) Haynes are sisters struggling with their own musical act when Betty writes a letter to Bob Wallace claiming to be from one of his fellow soldiers…her brother. Wallace and Davis attend the Haynes sister’s act one night, and the rest is history as both couples fall madly in love (with all the trials and tribulations that come with that). We LOVE this Christmas Classic (except for the modern dance routine, which I fast-forward thru) and watch it every year. Great fun. Listening to Bing sing “White Christmas” is a classic classic classic: The perfect Christmas song sung by a legend. Go to IMDb for more information. We watch this every year on DVD.